Flying Eagles coach Paul Aigbogun has vowed that his team will represent Africa in FIFA U20 world cup in poland later this year. Aigbogun also revealed that the national team will go all out for a victory in their final Group A match against hosts Niger at Stade Général Seyni Kountché, Niamey tomorrow. 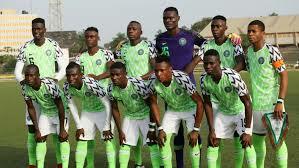 Flying Eagles After two rounds, the Nigeria U20s lead the way in their group with four points and even a draw would be good enough for them to qualify for the semifinals of the U20 AFCON as well as the 2019 FIFA U20 World Cup in Poland as one of the CAF representatives. Nigeria missed a chance to top the group after two matches following the goalless stalemate with South Africa on Tuesday evening. In his post-match reactions after Tuesday’s game, Aigbogun told reporters : “To say that we are satisfied with the result is not entirely obvious since we had prepared well for this match but unfortunately we came across a well-organized team and we had difficulties to break them down. “We wanted to win this match but we settled for the draw. The next game will be very dangerous for us to look for a draw. We will go into that game hoping to win as in our first match”. Nigeria are the most successful team in U20 Africa Cup of Nations history with seven titles won.